leaves any room for interpretation as to what kind of game this is. If it’s not obvious by now, I love games. Not just video games, but board games and card games as well. I grew up playing a lot of card and board games with my family, so even though I don’t get to play them as much today, I still enjoy them. Certain games stick with you, even if it has been years since you’ve played them. I can sit down and play certain games any time, and it doesn’t take long to get back into the groove. However, some of the board games I grew up with are much harder to go back to, because I was never very good at them. Such is the case with much of this collection. you quite specifically what games you’ll be playing on this cart. To be fair, I never much played Chess, Checkers, or Reversi competitively. As for Backgammon, I never played it as a kid. I was always kind of fascinated with the idea of Backgammon, but it looked too complicated. I also don’t recall any of my friends who played it. My parents had a game table that had a game called Carrom, and it had space for Backgammon, checkers, and other games, but we never played it. Regardless, I haven’t played the other 3 games in years, and it shows. needing a 2nd Game Boy. It was very nice of Beam Software to do so. The 4-in-1 Fun Pak consists of portable video game versions of Chess, Checkers, Backgammon, and Reversi. There are 1-player versions of each game, and 2 modes for 2 different players. The first mode allows 2 players to use the same Game Boy, and just pass it back and forth. The second is for players who have 2 Game Boys, and 2 copies of the game, like most “Game Link” supported carts. Even without having played the game yet, I was pleasantly surprised with the inclusion of the first 2-player mode, as it’s not often that a game maker can, or is willing, to include such a thing. Kudos to Beam Software and Interplay for including this feature, as I’m sure it helped keep the peace amidst a few long car rides back in its day. This screen makes Checkers look A LOT more exciting than it really is. I’m not going to go into the rules of each game, as they’re all pretty common games that most anyone who has ever played a board game should at least be familiar with in name, if not having played at least one of them. Checkers is pretty widely known, and though Reversi may not be as common, but it’s also known as “Go” (with slightly different rules, I believe), and was marketed in the US as Othello by Mattel. Backgammon is pretty much the same game all over, though depending on the layout of the board, can play slightly different, from what I understand. And of course there’s the age old game of Chess, here using one of the oldest chess software engines out there, known as “Sargon”. It was written as early as 1977/1978, and was apparently used in a handful of famous chess matches against other chess engines, and against real chess champions to test the engine’s algorithms. One assumes the name “Sargon” is a reference to the Akkadian king. With games of this type, it’s almost guaranteed that the graphics are going to be extremely basic, and totally utilitarian. If you were thinking that would be the case, you would be right. The checkerboard for Checkers and Chess looks like you would expect – black and white alternating spaces (or light green and dark green, if you’re playing on the original DMG model), and the game pieces look as good (or not) as you would expect them to. The pieces in Reversi and Backgammon are as basic as they come, but they serve their function just fine. There’s very little animation going on, so for playing on the original hardware, this is actually a prime game to play without having to worry about screen blur. Aside from that, there’s very little here to attract you to the game, but then, if you’re playing board games on a tiny 160×144 pixel screen, you’re hopefully not going to expect anything too fancy. and I suffered a checkmate. That happened within 5 moves. Sound is a mixed bag. The sounds that play when you select and move pieces are pretty basic beeps, which aren’t too obtrusive and sound fine. The sound that plays when you make a mistake is super annoying – it’s that kind of minor chord, mid-tone sound that you’d expect from the Atari 2600 or similar early 8-bit console. What’s worse, it plays constantly until you either press the A or B button, or press a direction on the D-pad. If you’ve selected music to play, it plays over top of that as well, creating a terrible cacophony until you press a button to stop the grating sound from playing. Speaking of music, there are 2 themes you can choose from by pressing the Select button during play, choosing the “MUSIC” option, and choosing which of the 2 themes you want to listen to. Both are perfectly pleasant, and while they may get annoying after 15 or 20 minutes, they’re nice little tunes that fit the slow, methodical pace of these board games. Did I mention that the “Invalid Move” sound is really annoying? In terms of options, each game seems to have a number of them. 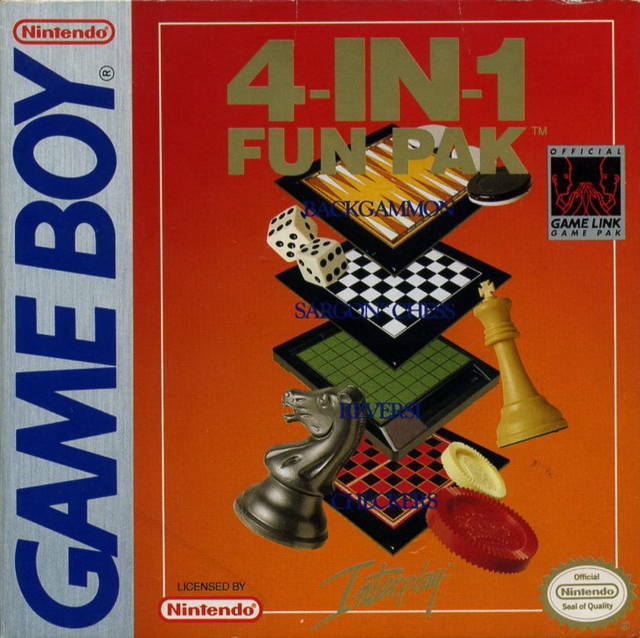 Checkers, Reversi, and Backgammon each have 3 difficulties. Chess, on the other hand, has 6 in total. In Checkers and Reversi, there’s a “Take Back” feature, which is sort of like an “undo” option. You can roll back moves as many times as you like, in order to get a better sense of the progression of the game, and fix your mistakes. This might seem like cheating, and in all reality it is, but used sparingly, it can give you a bit of cause and effect to help you learn the game strategies more effectively. The “Reset” option allows you to exit the game you’re playing and go back to choose another, which is a nice touch. Backgammon includes the “Double” option (part of the rules of the game), as well as an “Auto Roll” feature, presumably to speed up the progress. All games include a “Swap Sides” feature as well, and this is definitely something that could be exploited to cheat and “win” the game without having to put forth the effort. I’m not sure what the purpose of that is, and since I don’t have the manual, nor can I find a scan online, I honestly don’t know what Beam Software was thinking by including that. a quick defeat. I wasn’t far from that scenario here. I mentioned it before, but it bears repeating – I really appreciate the inclusion of a “single Game Boy” feature. If you were a “typical American family” during the late 1980’s or early 1990’s, you probably went on a number of road trips to see family, see the sites, or just get out and drive. In order to keep the peace, before the advent of such niceties as built-in DVD players, and to prevent you from having to play the same children’s song cassette 30 times, you might have bought your kids a Game Boy. If you were wealthy, you might have bought more than one, but the average middle-income family probably only owned one, unless one of the kids saved up a bunch of allowance or lawn mowing money to earn one. With potentially only one Game Boy game in the car for a multi-hour jaunt across country, this is the type of game that would have made the trip more fun, and because of the slow pace, and the fact that each of these games can be drawn out, depending on the amount of time each player takes to move, a couple kids could easily burn 20 or 30 minutes on a single game of Checkers, and more on a game of Chess. Similarly, a rousing Reversi match might be a good 15 minutes, and Backgammon would vary, though you could easily get anywhere from 10-30 minutes from a match. The original Game Boy’s blur-prone screen would have had no issues with this, and as long as you were driving in good sunlight, I can see how this would have been a good choice for kids who appreciated these kinds of games off-screen. AI has doubled my score, and is well on its way to trouncing me. Incidentally, because I had never played Backgammon before, and didn’t know the rules, I tried several times to play before I broke down and looked it up. I tried to read through a rules website, but quickly became bored with the dry explanation. I then went to YouTube and searched “How to play Backgammon for beginners”, and was greeted by an entire series of short videos by a heavy-accent bearing man from what I can only assume is the UK. I spent over half an hour watching these intro videos, and though I still fumbled with the game after that, I was actually beginning to figure things out. I downloaded a Backgammon app on my iPhone after that, and having played a few matches on that, I went back and finally got the swing of this version, after figuring out which direction I was supposed to go with my pieces. I had missed that salient point early on, and it was throwing me off. For the Backgammon beginner, I would recommend looking up tutorials, because it took me a long time to figure out how to actually play. Once I did, I began to actually employ some strategy, and have even been able to win once or twice. Given the chance now, I think I could play Backgammon in real life and enjoy myself, so I owe it to this cart for formally introducing me to it, despite the challenges in getting it figured out. the Sargon engine’s ability to calculate moves. Bummer. So what’s the verdict here? That will depend largely on your affinity for these board games. I’m terrible at Checkers currently, because I haven’t played in years. My dad tried, and failed, to teach me to be strategic in Chess, and my childhood best friend didn’t fare much better, so I never really learned to play it well. I’ve always been pretty bad at Reversi, having been regularly stomped on in school when playing it as Othello. Backgammon, however, is intriguing to me because I never played it as a kid, and it seems like the combination of strategy and luck makes it stand out more for me than the other games. I can’t say I would spend much time with it, but had I owned this as a kid, my younger brother and I would likely have spent a fair bit of time with it in the car, seeing as how I owned the Game Boy, and he was often left to just watch me and sulk because he didn’t. There are fancier versions of each of these games available for modern smartphones these days, so unless you’re looking to conserve your phone battery so your kid doesn’t run it down playing these games, it’s a good, relatively inexpensive alternative. Still, it’s hard to recommend nearly 25 years after its release, if only because most anything you can get today, for free even, would look, sound, and play vastly superior to this iteration. Still, for a few bucks, it’s a decent enough time waster. I’ll give it a casual recommendation, if you can find it cheap. I probably paid more than it was worth, at either $7 or $8, as I wouldn’t pay much more than half that, unless you’re a masochistic collector like I am. Backgammon, board games, Checkers, Chess, Game Boy, Game Boy Guru, Game Reviews, othello.